Our entire family is vegetarian except for little Aria and me so Meatless Monday isn't something out of the ordinary in our household. It’s part of an effort on my part to eat a little bit healthier by reducing our meat consumption. If we can hit two targets with one bullet, I want to go for it. And since I'm keeping a strict vegetarian diet this week with the beginning of the Vietnamese Tết celebrations (a tradition of Tết is that you eat vegetarian (ăn chay) on the last day of the previous year and first day of Asian New Year), it's perfect timing for this.. 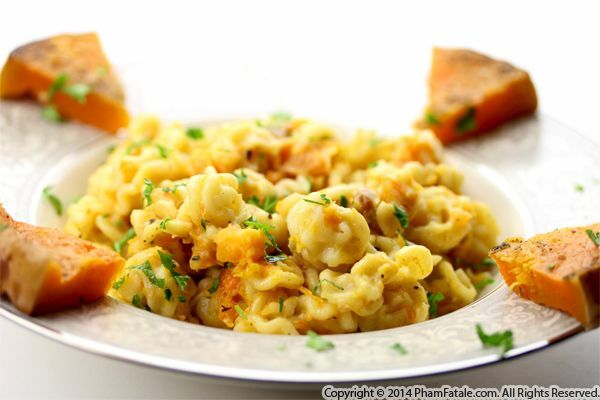 I prepared roasted butternut squash and mixed in cooked radiatore pasta. It's super easy to prepare and if you want to be on the healthier side, you can completely omit the cheese from the sauce. The next few days mark the beginning of the Vietnamese Tết celebrations. 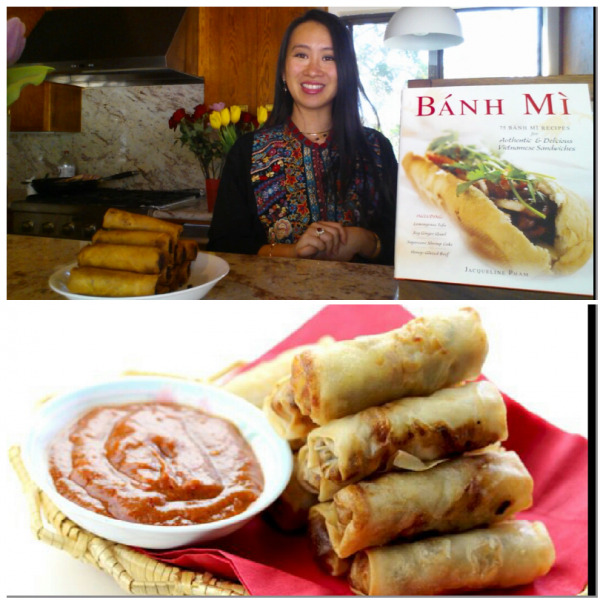 A tradition of Tết is that you eat vegetarian (ăn chay) on the last day of the previous year and first day of Asian New Year, so I will be sharing several Vietnamese vegetarian dishes with you until the celebration commences. 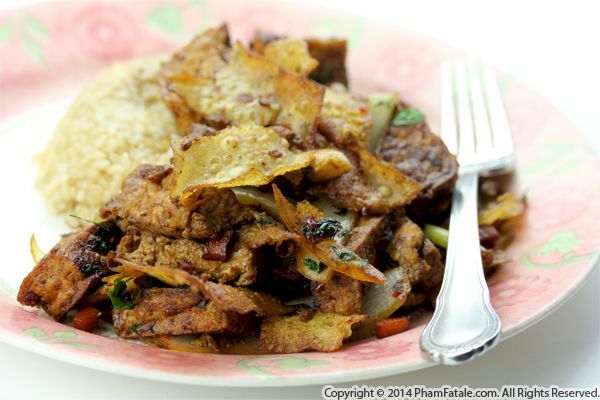 I prepared a tofu dish that included a typical Vietnamese vegetable called trái su su in Vietnamese. It's also known as chayote in English, christophine in Creole and French and it's from the squash family. So as you can imagine, if not cooked over high heat (to allow as much liquid to evaporate as possible), the dish can become very watery and soggy. To balance the texture of the dish, I added crispiness by crumbling fried wonton wrappers. 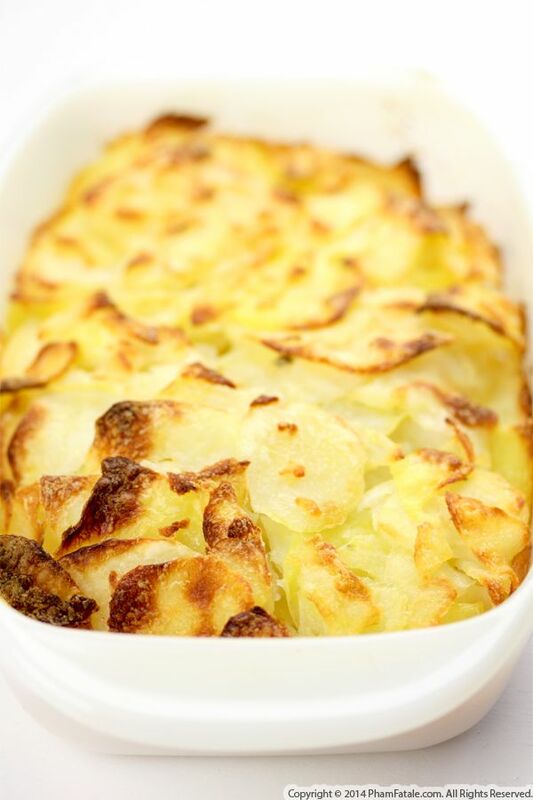 Gratin dauphinois is one of the gourmet potato dishes featured in my first cookbook Haute Potato. It consists of just potatoes, cream, cheese, butter and a little salt, with fresh-cut herbs on occasion. This potato gratin is delicious and easy to make. Today, I prepared a version using zucchini. This is a great way to conceal a nice portion of vegetables, especially if you're trying to feed children who don't like to eat their veggies. You can easily replace it with other greens such as broccoli. It's that easy! "Le tour est joué" (That's all there is to it! in English). It's Meatless Monday and I'm sharing with you today a dish I especially prepared for my friend Vincent whom I visited in Los Angeles last week. My main concern was to prepare something that would let me pass security at the airport and of course, something delicious! I made a savory, 3-layered pine nut free-form pie (crostata-like pie). 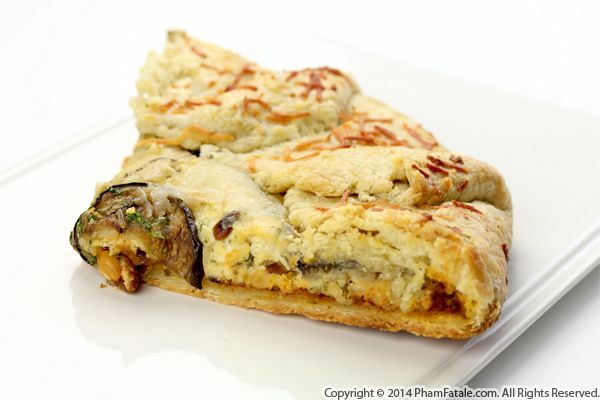 The savory crust was made from scratch with quality butter. First, I used a basil pine nut pesto, then topped it with an arrabbiata sauce (garlic, tomatoes and bell peppers) mixed with pine nuts and harissa (for a hint of spiciness); the last thick layer was a ricotta, pine nut, and lemon mixture garnished with grilled zucchini. I love the concept of an organic-shaped, free-form pie. It's a fuss-free, don't-need-a-pie-pan dish, which maintains its flakiness better than a pie. I improvised almost all the components of this savory pie, using homemade sauces I had previously canned. It really doesn't matter how much time you devote to a dish; my philosophy is that, as long as you put your heart and soul into cooking I guarantee that those who will enjoy the product of your efforts will appreciate it. Page 159 of 163 pages.